You won't believe the rich texture and taste of this deceptively delicious dish. Sprinkle 1/2 cup stuffing mix onto bottom of 13x9-inch baking dish. Add hot water to remaining stuffing mix; stir just until moistened. Place chicken in baking dish. Combine soup, sour cream, cheese and vegetables; spoon over chicken. Top with prepared stuffing. 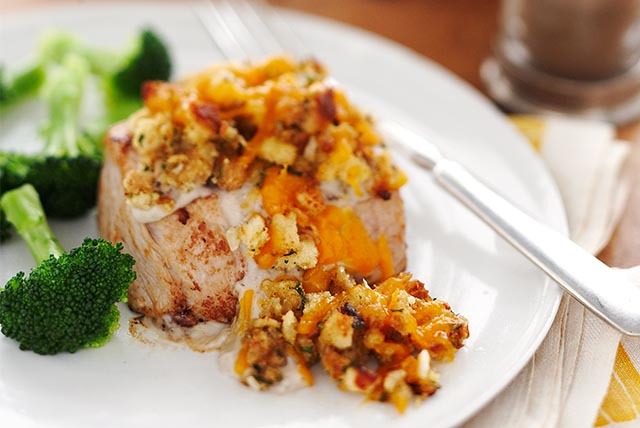 Package boneless skinless chicken breasts in recipe-size portions in the freezer. Thaw only the amount needed for a recipe. When thawing chicken under running water, be sure to use cold water. Keep the chicken in its original wrapper or place in a water-tight resealable plastic bag. Be careful not to cross-contaminate other food products, work surfaces or utensils with the dripping water. The cheese and sour cream in this hearty casserole team up to provide a good source of calcium, per serving.